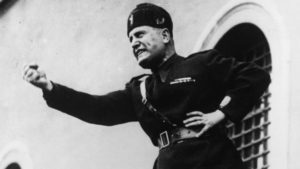 Italy’s alliance with Nazi Germany certainly influenced the adoption of racist and anti-Semitic policies by Mussolini’s government. In a 1938 document called the Manifesto of Race, the fascist regime declared Italians to be Aryans, and that Jews and other minorities would be expelled from civil life. However, even prior to the alliance with Germany fascist Italy was quite capable of being racist on its own. Laws in conquered Ethiopia banned marriages between blacks and whites, and the best available land in Ethiopia was redistributed to Italian immigrants. In the end, Italy became a willing partner in spreading Nazi racism, and thousands of Italian Jews would eventually die in the Holocaust.